Like I said in yesterday’s post, T is for Time, it seems like there are never enough hours in the day, and it’s fun to fantasize about what I would do if I had all the time in the world to do whatever I wanted. Our ever-evolving technology and growing access to information has fooled us into thinking that we can save time. There are shortcuts for everything and we can look up anything we want to know in a split second. The only problem with that is that we’re constantly searching for more. More gadgets to entertain us, more knowledge to absorb, and more ways to stay in touch with people. Now, it would be unrealistic to phone all of your friends multiple times each day to see what they’re doing (and to tell them what you’re doing). But you can check their Facebook status updates three, four, ten times a day if you want to. Despite the fact that we might feel more efficient, we’re actually wasting a lot of time on these activities. I had planned to make several changes in the new year and here it is already April (again, where does the time go?) and I feel like I need to revisit those New Year’s resolutions. One of the things I had wanted to focus on was living more intentionally and being present in the moment. It fits right in with the concept of time; I have to keep reminding myself that the past is gone and the future’s not here yet, so it doesn’t make sense to obsess over either one. Instead, I prefer to be living in the moment, while also not being bombarded with information. Weaning myself off of distractions such as Facebook was a part of that plan. Not that I was a Facebook addict to begin with. I had already edited a good portion of my personal information, stopping just short of deleting my account altogether, mostly out of aggravation over their changes and privacy issues. Just as an experiment, I gave it up for over a month and have only logged in once since I was “allowed” to go back, browsing around the site long enough to confirm my suspicion that I hadn’t missed anything. I love the term digital sabbatical. Basically, it’s a vacation away from phones, computers, and televisions. It can mean a few hours, a weekend, or even a whole month of being unplugged. Sometimes you just need a break. When I’m online, I tend to research things to death and absorb as much information as possible, especially if I need to make a decision about something. But, in the end, having so much information is not comforting. It’s actually counterproductive and stressful. In many religions and cultures, Sunday is a designated day of rest. Of course, we don’t always feel like we can afford the “luxury” of resting. Too often, we feel like we need to fill any free time with items that we can then cross off our to-do lists. If you have to clean your house or work in your garden, go right ahead. Unplugging doesn’t mean you have to sit and stare at the wall. Unplugging means taking a conscious break from the noise of technology–cell phones, email, Facebook, Twitter, blogging, you get the idea. You don’t have to write a blog post for this Sunday, so why not leave the computer turned off and do something else? Go for a walk if the weather’s nice, or meet a friend in person for coffee rather than texting him or her. The whole point is to take a step back and realize that you will survive without technology, and that unplugging can make you feel more in control of the time that you do have. Do you believe that digital sabbaticals are worthwhile? How do you unplug? Never heard the term “digital sabbatical” but I think I am desperately in need of one! 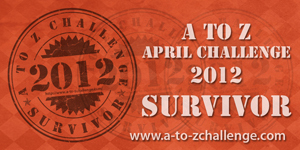 Great post – enjoy the rest of the A to Z Challenge – we are almost there! Thanks! A few minimalist bloggers have used the term digital sabbatical. Not sure who originally coined the phrase. I’m ready for the challenge to end! I really love this. A couple months ago, I made a very specific goal to “unplug.” I live alone, so when it’s quite, it’s QUIET. It used to kind of weird me out, but now I love it. No TV, no radio, no iPod. Just….quiet. I try to do this at least a few times a week. Peace is nice. Ophelia, that sounds awesome. Sometimes being alone with your thoughts is enough. It’s nice to have that quiet time to read or write. Usually, though, the computer actually becomes a distraction. Case in point: I currently have 14 tabs open on my browser that I keep clicking between…. After the A2Z Challenge a digital sabbatical sounds divine! Cindy, Agreed! Everyone’s doing so well and they deserve a rest afterwards!